Taupo’s largest multipurpose sports ground. Owen Delany Park is Taupo's largest multi purpose premium sports ground with a capacity of 37,000 and is capable of hosting a variety of sporting and recreational events. It is the home ground of legendry King Country Rugby Club and hosted several games for the 2011 Rugby World Cup. Seat Renew restored the grandstand of bucket seats which were more than 10 years old. These were dull, faded and oxidized from years of use and exposure to the conditions in New Zealand. At first the seats appeared to be a light blue/white colour but restoration revealed their original colour was bright blue. The stand looks great with seats that look new and are protected against future deterioration. The restoration was conducted onsite without the need to remove seats from fixtures and at a convenient time for stadium operations. "Taupo District is very proud of Owen Delaney Park and tries to present it in the best way possible. Recently we have hosted live NRL games, pre-season super rugby and a qualifying football tournament for the 2012 Olympics all which have some form of TV or national interest. 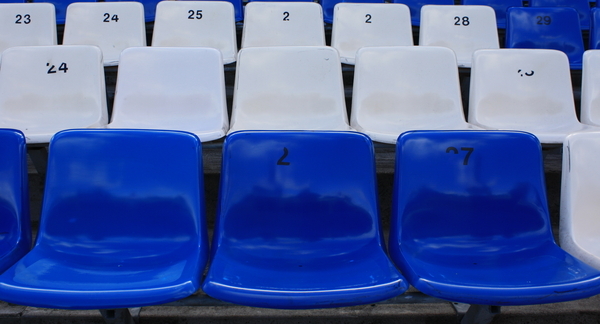 Like all Local Authorities we have a small budget to deliver these major events and one of the things we have struggled with has been how to deal with our ageing seats, which are hugely expensive to replace. Then we were approached by Seat Renew who introduced their product which would rejuvenate seats. The outcome is obvious from the before and after shots and, with the correct aftercare we are now in a position where the seats (which although affected by UV were perfectly serviceable) look like new and will offer an exended life".